Pra Somdej Pim Sorng Hnaa 2 sided Votive Tablet with Gemstone Fragments,, this exhibit being extremely rare, features the Pim Prok Po Sam Chan on one side, and the Pra Pim Pruhnang on the other side. A now extremely sought after series from Luang Por Guay, which has now officially entered the Tamniab Wadthumongkol Pantheon of Luang Por Guay, and is accepted by all major amulet appreciation societies. More than 4 Decades ago, Luang Por Guay made these Exquisite, and now Incredibly Rare Inner Circle Collector Pieces. In the year 2512 BE he passed them on to the Abbot of Wat Racha Nadda, who empowered them even further with a host of great masters who passed through. The amulets were then given a final Putta Pisek Blessing with Pra Maha Gomaes inviting Luang Por Guay again to Preside over the final Putta Pisek Ceremony in 2515 BE. 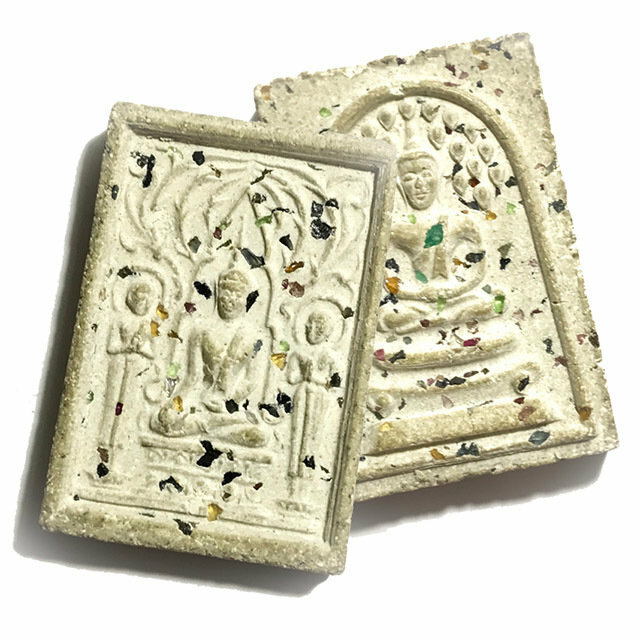 This particular Pim, which is 2 sided, with a different Buddha image on each side (Pim Sorng Hnaa), is the rarest of all the Pra Somdej Roey Ploi amulets Luang Por Guay made, and is extremely difficult to encounter. This particular version with Pra Pruhnang on rear face, is perhaps the rarest of all the Pra Somdej Roey Ploi Pim Sorng Hnaa models. The Pra Somdej Pim Sorng Hnaa is unusual in the sense that it is a two sided Pra Somdej, with a different Buddha Image on each side of the Votive Tablet. The front face is a classic Pra Somdej Sam Chan (3 tiered). The Buddha is seated under the falling leaves of the Bodhi Tree, making this a Pim Prok Po. The amulet is filled with sprinkled fragments of precious and semi precious gemstones, which increases the Beauty, Monetary and (due to the empowerment of the gemstone fragments beforehand) also sacred value of this Ultra Rare and Classic Collector's Masterpiece. The other side shows the Pra Pruhnang, which features an image of the Buddha in Mara Vichai (subduing Mara), seated touching the earth, calling the Dharani Earth Goddess as his Witness. The two Savaka Pra Mokkhallana and Pra Saributra are standing to either side of the Buddha, who is surrounded by a decorative Arch. On the side of the Pra Somdej Sam Chan, the second tier from bottom on the dais, is a 'Thaan Singh' (lion pedestal), notable by its outer edge decoration, reminiscent of a pair of curtains, or baroque interior design. This amulet and its other models are well documented, and now very rare to find, for the edition has now been officially accepted in the Samakom Pra Niyom the more common models are the Pim Prok Po Gao Bai (9 leaf Bodhi tree Buddha), and the Chinarat Buddha Image. One of the Rarest models is the Pim Hlang Pra Pruhnang model. This double sided Pim is the Rarest of all Pim, and as the Pim Pra Pruhnang model, is the rarest of the rarest, and thus a Definite Pim Niyom Category Showpiece. 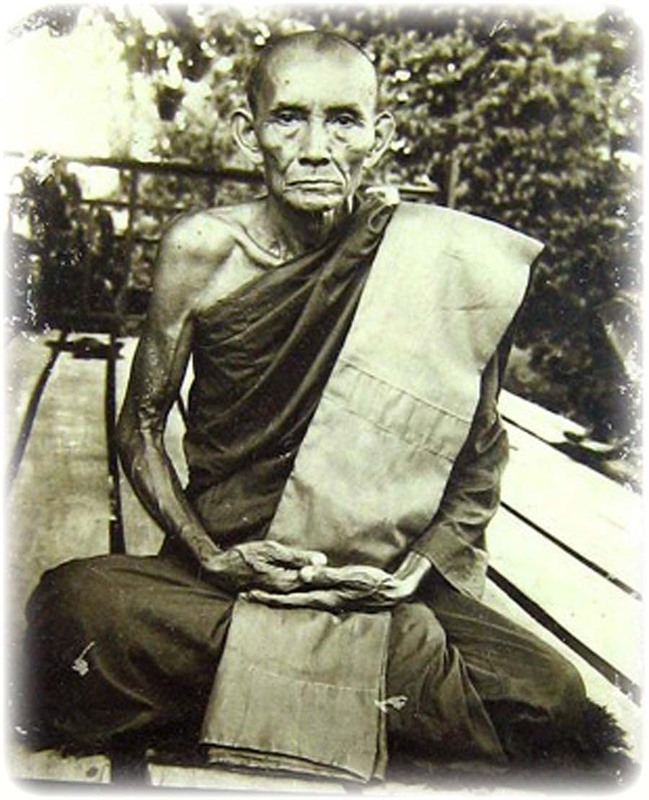 Luang Por Guay Chudtintaro (2448 BE - 2522 BE) was a powerful Sorceror Monk and Sak Yant Master with infamous powers of Kong Grapan Chadtri and Klaew Klaad Magic, whose large pantheon of Buddhist Votive Tablets and Krueang Rang Talismanic Occult Charms are amongst the fastest disappearing amulets of the Present Era, since a massive increase in faithful devotees in recent years, have begun to deplete the amulets from public circulation. In addition, the number of foreign devotees has also greatly increased over time, causing the faster depletion rate. Luang Por Guay's amulets have reached the highest level of respect and collectorship, and are considered to have noticeable effects that are felt be everybody who owns and wears one of his amulets.